This article is about the Chilean president. For the Antarctic research station named after him, see Base Presidente Eduardo Frei Montalva. This name uses Spanish naming customs: the first or paternal family name is Frei and the second or maternal family name is Montalva. Eduardo Nicanor Frei Montalva (January 16, 1911 – January 22, 1982) was a Chilean political leader. In his long political career, he was Minister of Public Works, president of his Christian Democratic Party, senator, President of the Senate, and the 28th president of Chile from 1964 to 1970. His eldest son, Eduardo Frei Ruiz-Tagle, also became president of Chile (1994–2000). Frei's Christian Democratic Party supported the Armed Forces intervention to remove his successor Salvador Allende from office in 1973, after the Chamber of Deputies, on August 22, 1973, accused Allende of violating the Constitution and called for his overthrow. He was later a vocal opponent of the Augusto Pinochet regime, which was accused of poisoning him with botulinum toxin during routine surgery. Eduardo Frei Montalva was born in Santiago on January 16, 1911, the son of Eduard Frei Schlinz, a Swiss-born ethnic German from Austria, and Victoria Montalva Martínez. In 1914, his family moved to Lontué, where his father had been hired as an accountant at a winery. In addition, his other two siblings, Arturo and Irene, were born. He attended the Escuela Pública de Lontué (Public School of Lontué). In 1919 the family returned to Santiago and Eduardo, as a young man, entered the boarding School Seminario Conciliar de Santiago where he remained until 1922. In 1923, he entered Instituto de Humanidades Luis Campino, where he graduated in 1928, at the age of 17. As an 18-year-old, he entered Universidad Católica School of Law in 1929. For two years, he had been visiting María, the sister of his friend, Alfredo Ruiz-Tagle. He attended high school and went on to study law, graduating as a lawyer in 1933. He married María Ruiz-Tagle with whom he had 7 children. His eldest son, Eduardo Frei Ruiz-Tagle, was President of Chile from 1994 to 2000. He began his political career in the Conservative Party, but was among a group of young men who founded their own party in 1938: the Falange Nacional. He was minister of Public Works in 1945, and in 1949, Frei was elected senator for Atacama and Coquimbo. The same year he published “Historia de los Partidos Políticos Chilenos” (“History of Chilean Political Parties”) in collaboration with Albert Edwards Vives. In 1950, he traveled to New York as a UN delegate. In 1952, at 41 years of age, Frei Montalva announced his first candidacy in the presidential elections. The 1952 election was won by Carlos Ibáñez del Campo. Later, President Ibañez requested Frei to organize an executive committee. However, this never came to be. In 1954, the UN appointed him President of the Commission in charge of elaborating the report of the Conference of Chancellors held in Rio de Janeiro. Some of its members were: Carlos Lleras Restrepo, former President of Colombia, and Raúl Prebisch director of ECLAC. The report served as a basis for subsequent studies on economic development and the integration of Latin America. In 1956 he was elected Senator in Santiago by first majority. On July 27, 1957, the Falange Nacional became the Christian Democratic Party of Chile, and he became the undisputed leader. Frei Montalva was offered once more the candidacy for president of the Republic in the 1958 elections. Jorge Alessandri Rodríguez was elected president while Eduardo Frei Montalva took only third place. During these years he published three more books: “Sentido y Forma de una Política” (“Meaning and Shape of Politics”), “La Verdad Tiene Su Hora” (“Truth Has Its Time”), y “Pensamiento y Acción” (“Thought and Action”). In 1960, he lectured at conference “The Mission of Universities in Latin America” in Montevideo; a widely promoted conference at that time. In 1961, he was elected President of the First World Christian Democratic Party Congress, held in Santiago, Chile. The congress was attended by delegations from throughout Latin America, European, North American, and African countries. That year he was invited as special guest to a seminar on the problems of Developing Nations, held at Oxford University. The seminar was attended by delegates from all over the world. He ran for president again in 1964. Declassified documents show that from 1962 through 1964, the CIA spent a total of $2.6 million to finance his presidential campaign and spent $3 million in anti-Allende propaganda "to scare voters away from Allende's FRAP coalition". The CIA considered its role in the victory of Frei a great success. That year he was elected with his "Revolución en Libertad" ("Revolution in Liberty") slogan by a large margin (56%), defeating Socialist candidate Salvador Allende who only received 39% of the vote, but who subsequently won the 1970 Chilean presidential election. Frei's administration began many reforms in Chilean society. "Promoción Popular" (Social Promotion), "Reforma Agraria" (Agrarian Reform), "Reforma Educacional" (Education Reform), and "Juntas de Vecinos" (Neighborhood Associations) were some of his main projects. He also took measures to rationalize drug supply. 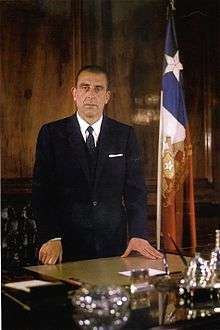 On September 4, 1964, having one of the highest turnouts in Chilean history, Eduardo Frei Montalva was elected President of the Republic of Chile. He took office on November 4 of the same year. The Frei presidency did much to tackle poverty, as characterised by the growing share of wages as a proportion of GNP. By the end of the Frei presidency, the wage and salaried sector received close to 51% of GNP, compared with 42% at the end of the Alessandri presidency. This positive redistribution of wealth was encouraged by government policies, particularly in the rural sector, where wages rose by 40% in real terms. Between 1964 and 1970, total enrolment in education increased by 46%, while around 250,000 houses were built, mostly for the poor. Frei's administration also introduced a wealth tax and carried out a property tax reassessment in order to make the taxation system more progressive. Taxes a s a percentage of GNP increased 12.8% in 1964 to 21.2% in 1970. The social reforms introduced by Frei’s government led to a huge increase in public expenditure, which rose as a proportion of GNP from 35.7% in 1965 to 46.9% in 1970. Expenditures on education, agriculture, and housing rose went up considerably, with spending on housing increasing by 70% in real terms in 1965 alone. During Frei’s six years in office, an average of 40,000 housing units were constructed each year, and a total of 100,000 lots were assigned. Investments in primary care clinics and hospitals were also carried out, with 20 clinics and 16 hospitals built between 1965 and 1969. On his return, he initiated important plans involving housing, education, reforestation, land reform, health, and the nationalization of copper. The Comisión Nacional de Cultura (National Culture Commission), the Consejería Nacional de la Promoción Popular and the Juntas de Vecinos (“Neighborhood Committees”) were also created. One area of reform given high priority by the Frei Administration was the fostering of networks of local, self-help organisations (especially among the “unorganised” residents of the shantytowns), which was placed under a national supervisory council. As a result of the government’s actions, Mothers’ centres, sports associations, youth clubs, residents’ committees, and parents’ groups proliferated, with an estimated 20,000 units of this type in existence by 1970, according to government figures. Half of these new units were mothers’ centres, with an estimated membership of 45,000 women, and the government claimed to have distributed 70,000 sewing machines to these centres. According to Frei, these measures had given “a new form of life and hope” to hundreds of thousands of people. On 25 March 1969, the ESO site at La Silla was finally formally inaugurated by President Eduardo Frei Montalva. Improvements were also made in areas such as housing, education and medical care. Between 1964 and 1970, around 260,000 houses were constructed (around a third by the state housing corporation CORVI) and about 200,000 housing solutions were claimed (referring to the provision of sites for self-help housing projects). The number of hospitals (and beds) doubled under the PDC, and spending on education as a proportion of public expenditure rose from one-seventh to one-fifth. Around 3,000 new schools were built throughout the country, and by 1970 95% of children in the relevant age group were covered by primary education. Expenditure on scholarships and school loans was doubled, and school enrollment was raised from 1.8 million to 2.9 million. Expenditure on education doubled, the number of years of basic education was increased from six to eight, and a two-shift school-day was introduced that doubled the capacity of the country’s system. Frei’s initiatives in education led to increased rates of enrollment in both primary and secondary education, with primary school coverage reaching 90% in the majority of rural and urban areas by 1970, while secondary school coverage reached 49% in 1970, compared with 18% at the start of the Sixties. A new law establishing work-accident and occupational disease insurance was signed into law in January 1968, providing for compulsory coverage of all salaried employees and wage earners, including apprentices and domestic servants. In March that year, a piece of legislation creating government-sponsored health insurance for public and private salaried employees and their dependents was signed into law. Basic health services were expanded with the training of community health workers, the building of rural health clinics, and the shifting of financial and personnel resources from hospitals to community health centres. These efforts contributed to a steep decline in infant mortality in Chile during the Sixties and Seventies. Much attention was also given to improve social and economic conditions in the countryside. Both rural unionisation and agrarian reform were accelerated, with the government starting to expropriate estates in a serious way. Family allowance for farmers was doubled, the agricultural minimum wage was raised to the same level as its urban equivalent, and an agrarian reform law signed by Frei in July 1967 made all farms of more than eighty “basic” hectares liable to expropriation. The Frei Administration had thus made a major start to land reform, a policy continued by the Allende Government. The agrarian reform carried out by the Frei Government organized the reformed sector according to a temporary system established in the law, whereby the expropriated estates became asentamientos. This was a legal form in which the farm operated as a joint enterprise between the state and the peasants who had lived in the former latifundia (extensive agricultural estates), with the state providing the credits, land, and technical assistance, and the peasants their labor. After an indeterminate period, the land would be made available for subdivision into small private plots, if the peasants wished. During his administration 8 workers were killed in El Salvador mine and 11 squatters in the Massacre of Puerto Montt. His Minister of the Interior, Edmundo Pérez Zujovic was politically blamed for the deaths. On 21 October 1969 the Tacnazo insurrection, occurred—a brief non-violent demonstration of the Tacna artillery regiment in Santiago, led by General Roberto Viaux. In 1966, the Andean Group, officially created through its Declaration, signed in January 1965. However, the group culminated with the famous speech delivered by Eduardo Frei Montalva in Plaza Bolívar, Bogota. The same year the pacts on Chilean copper were signed. In January, 1967 the National Congress refused his constitutional permission to travel to the United States where he had been invited by President Lyndon B. Johnson. In April, he participated in the Meeting of Presidents from American countries, carried out in Montevideo, Uruguay. In 1970, he was awarded with the Doctor Honoris Causa title by the Pontificia Universidad Católica de Chile. On November 4, he left office, handing over the Presidency to Salvador Allende. After Allende's 1970 victory, Frei became convinced of what he called a "totalitarian project" to impose a Communist tyranny. In 1971, he gave conferences at universities in Dayton, Ohio, Boston, and the Council of the Americas in New York, denouncing in all of them the actions of the Allende government that were violating the Constitution and the laws of Chile. In the March 1973 parliamentary elections he was elected Senator for Santiago by a first majority. He was afterwards elected President of the Senate and became the leader of the opposition to Allende. On September 11, 1973, during the coup d’etát President Salvador Allende committed suicide in the presidential palace, La Moneda, as the Armed Forces seized power. His Christian Democratic Party supported the Armed Forces intervention to remove Allende from office in 1973, after the Chamber of Deputies, on August 22, 1973, accused Allende of violating the Constitution. In November 1973 Frei wrote an historic letter to Mariano Rumor, President of the International Christian Democrats, endorsing the Armed Forces intervention and denouncing what he alleged was an attempt by Allende to impose a Communist dictatorship in Chile. Between 1973 and 1977, Eduardo Frei Montalva was invited to different countries and participated in conferences, such as the Atlantic Conference in 1976. In 1975 he published his book “El Mandato de la Historia y las Exigencias del Porvenir” (“The Mandate of History and Demands of the Future“), and in 1977 his quintessential book “América Latina: Opción y Esperanza” (“Latin America: Option and Hope”) which has been translated into several languages. In the period between 1977 and 1982, he was invited to participate in the Brandt Commission, led by Willy Brandt. As a member, he attended meetings held in Germany, Switzerland, Mali, United States, Malaysia, France, Austria, Belgium, and Great Britain. As a Brandt Commission delegate he engaged with important executives from IDB, OAS, and ECLAC. In 1980, he participated in the Meeting of Former Democrat Presidents of Latin America held in Caracas, Venezuela. In 1981, he was invited to the Club of Rome International Conference on the “Alternatives for Humanity: Latin America Mission” also held in Caracas. His last book “El Mensaje Humanista” (“The Humanist Message”) was published. Later, Frei became an opponent of Pinochet's military government. He opposed the extension of Pinochet's presidency in 1981, leading a rally against it. On January 22, 1982, Eduardo Frei Montalva died in Santiago, six days after turning 71. In 1981 Frei was suffering from chronic acid reflux, stemming from a hiatal hernia, an unpleasant but not life-threatening condition. He was operated on for it, but died in Santiago on January 22, 1982; his death at the time was attributed to septicaemia stemming from surgery. He was buried in the Cementerio General de Santiago. It was later alleged that Frei had been poisoned by the DINA, the intelligence service of the military government, with a toxin produced by biochemist Eugenio Berrios. After researchers from the University of Ghent, Belgium were reported to have found mustard gas in Frei's body, the former president's family filed a lawsuit, which was pending as of 2009. Frei's personal doctor, Patricio Rojas, who was also his Minister of the Interior, denied the accusations. El Mercurio columnist Hermógenes Pérez de Arce disputes even the existence of the Belgian report, citing the denial by the University's chief of communications, Tom de Smedt, that an investigation had been done in that university. Tissue samples sent to FBI labs and to the labs at the University of Ghent showed no evidence of toxic substances. A Chilean doctor reportedly found residues of sulfonic salts which can be the result of the decomposition of mustard gas but can also be the result of the decomposition of a corpse. In December 2009 six persons were arrested for their roles in the alleged assassination. Judge Alejandro Madrid based his decision on a report that determined that low doses of thallium and mustard gas were administered to Frei over an extended period while he was hospitalized at the Santa María Clinic in Santiago, and that these toxic substances had the effect of decreasing Frei's immune system, making him too weak to survive his surgery. The report was widely criticized on scientific grounds, and by the surgical team. The Appeals Court suspended Judge Madrid from the case, and the accused were freed on bail. The case was re-opened in 2010 after a failed attempt to disqualify Judge Madrid. In April 2013, the body of poet Pablo Neruda, who died in 1973 in the same hospital one day before departing for exile, was exhumed amid suspicions of foul play in his death. ↑ "Chile 1964: CIA Covert Support in Frei Election Detailed". The National Security Archive. Retrieved 25 June 2015. ↑ "Memorandum for the 303 Committee:Final Report: March 1969 Chilean Congressional Election". U.S. Department of State Office of the Historian. Retrieved 26 June 2015. ↑ Collins, Joseph; Lear, John (1995). Chile's Free-market Miracle: A Second Look. Food First. ISBN 978-0935028638. ↑ Pribble, Jennifer E. (2008). Protecting the Poor: Welfare Politics in Latin America's Free Market Era. ProQuest. p. 209. ISBN 978-0549535881. ↑ McGuire, James W. (Mar 15, 2010). Wealth, Health, and Democracy in East Asia and Latin America. Cambridge University Press. p. 100. ISBN 978-1139486224. ↑ Haggard, Stephan; Kaufman, Robert R. (2008). Development, Democracy, and Welfare States: Latin America, East Asia, and Eastern Europe. Princeton University Press. p. 90. ↑ Letter to Mariano Rumor, 8 November, 1973, also at wikisource (Spanish). ↑ Forero, Juan (9 December 2009). "In Chile, case resurrects ghosts of bloody Pinochet dictatorship: Judge implicates strongman in 1982 death of ex-president". The Washington Post. Retrieved 10 December 2009. ↑ "Six arrested over assassination of former Chilean president". Telegraph Online. London, UK. 7 December 2009. ↑ "Detalles del auto de procesamiento contra médicos que lo operaron: "Con bajas dosis de Talio y gas mostaza durante varios meses asesinaron a Frei"". El Mostrador (in Spanish). 9 December 2009. Retrieved 10 December 2009. ↑ "Caso Frei Montalva: Enrique Paris sostiene que hubo un grave error en las muestras procesadas en Chile". La Segunda (in Spanish). Santiago, Chile. 22 December 2009. ↑ "Caso Frei Montalva. Carta del Dr. Fernando Orrego Vicuña". El Mercurio (in Spanish). Santiago, Chile. 13 January 2010. Anderson, Steve. "Body of Chile's Former President Frei May Be Exhumed". The Santiago Times. Retrieved 5 April 2005. "Ex-Chilean leader 'was murdered'". BBC online. UK. 23 January 2007. Retrieved 15 January 2009. Kornbluh, Peter (September 2004). "Chile 1964: CIA covert support in FREI election". The National Security Archive. Retrieved 5 April 2005. Pilleux Cepeda, Mauricio. "Recopilación de Genealogia Chilena" (in Spanish). Retrieved 15 January 2009. "Eduardo Frei Montalva". Biografía de Chile (in Spanish). Retrieved 16 January 2009. Wikimedia Commons has media related to Eduardo Frei Montalva.